Heads up dear reader, a whole lot has happened in the past 18 months and so this post is out of date. Please read my latest here – How to: OAuth 2.0 Flows in .NET using C# for updated guidance and a new .NET Authorization sample! Also, you can read the official sample documentation online here. 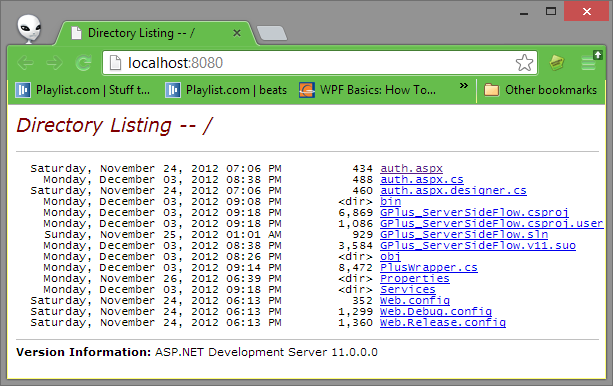 I recently was looking into creating a server-side application using the Google+ API and the .NET library. It’s slightly different from doing a client-side application in C# or a Windows store app. What’s different is that the client library will take the HTTP context from your server, then run the user through the authentication flow, finally giving you back a client with an access token and a refresh token. If you have Visual Studio and Windows, you can download the sample app. If you don’t have Visual Studio, you can download Visual Studio Express from MSDN to try this out. The “Binary Release” zip is all you need unless you want to debug into the various generated service libraries. The project needs to be set up with the references you downloaded. Once you have all the requisite references set up, you should be able to access the client libraries from your app. If you are trying the sample app, you will need to get a client id from the Google APIs console. Services, origins, and redirects for this client id must be turned on as described in the client-side flow. Next, enter the client id and client secret in the wrapper class, PlusWrapper.cs, replacing YOUR CLIENT ID HERE and YOUR CLIENT SECRET. The following code shows how the the Authorization flow is kicked off. // Use the client to perform all of the Auth steps. // Now we should have the Plus service object, use it to perform a simple operation. /// Creates the authenticator for the server-side flow. // If this user is already authenticated, then just return the auth state. // Check if an authorization request already is in progress. // Check to see if we have an access token and use that to generate the state. // Check to see if we have a refresh token and use that to get the auth state. // Store and return the credentials. // Otherwise do a new authorization request. response.Send(); // Will throw a ThreadAbortException to prevent sending another response. /// Creates a state object from a refresh token or access token. What this will do is place the Person object, me, into the current page’s scope. The following code shows how the profile data can then be accessed on the page. Members of the me instance are now accessible on the page because the object was returned from the call to Authenticate made using the wrapper class. What is also interesting is that the server now has credentials for re-authenticating the user. Although I didn’t expect it to be too difficult, I was still surprised with how easy it is to access the Google+ API from server-side flows. If you’re building a service or application that can use the library, you can get started very quickly, jumping right into accessing the available Google+ APIs. If you are a developer working on a Microsoft web stack, you should try playing with what’s available from Google+. Can you please help me to figure this error. @Uday Thanks for the comment! There are a number of things that could be causing this issue, when in your code is this happening? Is it happening the first time you make an API call to the fusion tables library? Is it a build time error? Thanks for this post, had been looking specifically for examples on using these C# libraries and found Google’s own documentation somewhat lacking. I can’t seem to open you project with any version of Visual Studio though (I have 2003-2010, and 2012 express). What version was it created under? 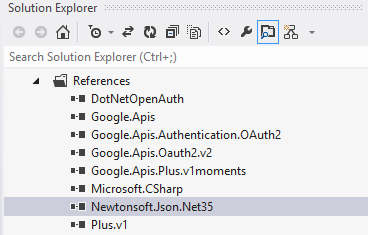 @robbievgb, these projects were probably written in VS2012 because it was what I had as default on my computer 🙂 However, Google+ has an officially supported quickstart Google+ sample targeting C#/.NET and Visual Studio 2010. How to get user email?? In addition to the functionality in the above post, i am trying to generate a access token and refresh token in exchange for the auth code returned . Unfortunately, using the google documentation at https://developers.google.com/accounts/docs/OAuth2WebServer#handlingtheresponse , i am unable to generate accesstoken and refresh token. i am getting a bad request error. It will be really helpful if you could provide you input on this. HOW I CAN USE THIS IN WCF? In wpf application i want to post and get comments into my google+ page. 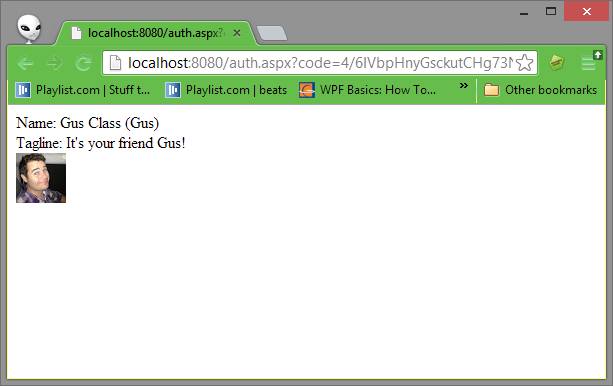 can i use wcf service for my wpf application to interaction with google+? I did not get email id with example above.